The Windows Store, a new online marketplace for applications for Windows 8 and Windows RT computers, is now open to developers in 120 geographic markets, Microsoft said on Tuesday. Any developer can now submit applications for inclusion in the store, which will feature free and fee-based applications delivered via a variety of methods. 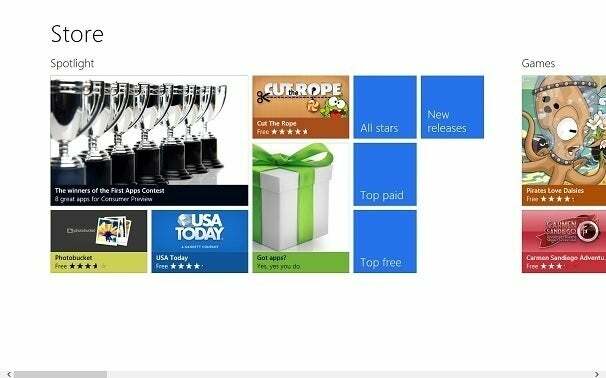 Windows Store applications make use of the new tile-based interface in Windows 8 and Windows RT, which formerly was called Metro and is now referred to as Modern. This interface is designed to work best on touchscreen devices such as tablets. Microsoft also announced that certain Microsoft Developer Network (MSDN) subscribers will receive a free one-year Windows Store developer account. To qualify for this perk, developers need to have an MSDN Visual Studio Professional, Test Professional, Premium, Ultimate or BizSpark subscription. The fee is also being waived for student developers with a DreamSpark subscription. Windows 8, designed for machines with x86 chips from Intel and AMD, and its version for ARM devices, Windows RT, will be released commercially on Oct. 26, when the first wave of desktop PCs, laptops and tablets will begin shipping. Support from developers will be key to the success of Windows 8 and Windows RT, so it will be interesting to see how many applications are available for the new operating systems at launch. The stakes will be particularly high for Windows RT machines, because the operating system will only run applications built specifically for it. Windows 8, on the other hand, will run existing applications for Windows 7.